The only materials that are to be placed into the compost containers are grass clippings, leaves, garden trimmings and excess fruit and vegetable scraps. Branches are NOT allowed and cause considerable damage to the equipment. Please do not place plastic bags of grass or garbage into the containers. There is a receptacle at each site for plastic bags. Note: The Forestry Department collects branches (less than 10 inches in diameter) from the boulevard on a weekly basis from May through October. Collection coincides with your garbage day. Brush and branches can also be hauled to the Fargo Landfill at no charge to Fargo residents. You can take your yard waste to one of our drop-off recycling sites that accepts yard waste. The City of Fargo provides numerous locations where yard waste can be dropped off from spring through fall. See the list of sites on our drop-off recycling locations page. From late October through mid-November, city crews collect yard waste from the curb. Please place yard waste in bags or cans and place them at least 5 feet away from your garbage cart. Solid Waste crews will collect yard waste with a separate truck in order to compost the large volumes of yard waste we receive in the fall. 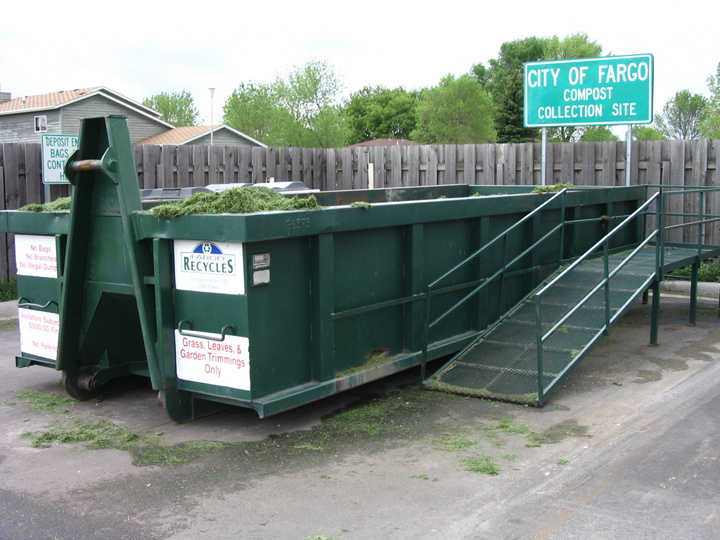 The City of Fargo offers a yard waste collection service for senior citizens and residents with disabilities. Contact the Solid Waste Department at 701.241.1449 for more information. This is one of several recycling drop sites in Fargo where residents can deposit yard waste during spring, summer and fall.